I bought this collection of James Tiptree Jr’s short stories (and two of Raccoona Sheldon’s) because I was going to be part of the 2011 Women in SF Book Club, being run over at the (now-defunct) Dreams and Speculation blog. D&S’s now-defunct status is part of the reason why it’s taken me the whole year to read the collection – although to be fair it would have anyway, since the idea was to read 1-2 stories per month for the book club. But instead I’ve read the last third in the lat two days. I tried to host the Tiptree bit here on my blog: I posted my own spoiler-y thoughts on Delicate Mad Hands and Houston, Houston, Do You Read? However, I didn’t get much interest in them, so I discontinued it. Now, however, I have finally finished the collection! And what a collection. 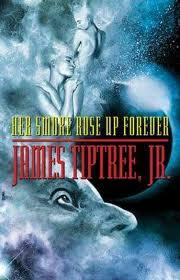 I have read bits and pieces of Tiptree’s work before, but most of these stories were completely new. The thing that most immediately strikes is that that they are intimately concerned with life and death, and with reproduction in defiance of the latter. I know this could be said about a lot of authors, but it really is a clear and obvious preoccupation in many of these stories. Perhaps not coincidentally, Tiptree can in no way be described as a happy writer. Which is not to say that she lacks joy; there is a great deal of that fierce, loving-life-in-the-face-of-death joy that can be both poignant and exultant, in these stories. * But you could bet on a story having a not-entirely-happy ending, and much of the time you would win. And yet I love it. Tiptree breaks my heart and yet I love her writing. She is confrontational – about humanity, about individuality, about reason – and she is challenging, she is grim and she breaks my heart but there are very few stories that I didn’t love in this collection, even if they gave me agony. What didn’t I like? I didn’t enjoy the titular “Her Smoke Rose Up Forever”, nor “Love is the Plan the Plan is Death.” The former was, I think, too… cold? for my liking; the latter was, dare I say it, a bit too weird – it was too hard to really figure out what was going on, who was speaking and why. Really, it just didn’t grab me. Ditto “And So On, and So On,” which was a let-down of a piece to end the collection with, although I guess I can understand the rationale; it sort of wraps up the entire collection and everything it’s been saying, and suggests that maybe it’s just the self-involved mutterings of a “kid these days.” That sort of deliberate invitation to dismiss everything that came before really didn’t work for me. However, that leaves 15 stories that really worked for me. The collection opens with “The Last Flight of Dr Ain”, and it meshes quite nicely with “The Screwfly Solution.” Both appear to deal with some sort of plague affecting the whole world, although the diseases have different impacts. “Screwfly” in particular is a scary read, as a woman – how male sexuality could be manipulated. “And I Awoke and Found me Here on the Cold Hill’s Side” – the title an allusion to Keats – is one that I had read before and one that gets me every single time. Human-alien contact stories generally fall into two categories: “zomg they’re going to kill us!! !” or love-in. Tiptree presents a third option: we care, they don’t. It’s a subtle story, and I think one that tends to play on the mind – whose impact deepens the longer you think about it. “The Women Men don’t see” deals with a similar-ish story, and is probably the least obviously SF of the stories in the collection. But the description of male/female interaction, and the perception particularly of men’s behaviour, is brilliant. And heartbreaking. Probably the weirdest story of the lot, also dealing with an alien encounter, is “A Momentary Taste of Being.” It’s also I think the longest in the collection, I’m sure reaching novelette length. It’s amazing and horrendous at the same time: the interactions of the humans on a survey mission are, to a large extent, frightful; the backstory Tiptree gives some of the characters abhorrent; the reality of the alien is weird and mind-blowing and masterfully original. I’m not sure that I loved it, but I’m definitely in awe. “The Girl who was Plugged In” is a most remarkable piece for 1973, anticipating as it seems to GPS and reality TV is horrendous ways. This is one that made my heart bleed and yet I loved it. It’s so clever – Tiptree had such a searing way of evaluating humanity, our foibles and penchants, and they come through here, in talking about what we love and what we discard; in this case, humans who do and don’t fit our preferences. That also connects in some ways to “With Delicate Mad Hands,” which is another heart-rending but fiercely awesome stories – of beating the odds, of being what you want to be, and finding fulfilment. Cold Pig is one of the most wrenching of Tiptree’s protagonists, because of what she endures and the dreams that she holds. “The Man who Walked Home” is post-apocalyptic and takes place over a long period of time, and shows Tiptree’s very clever manipulations of time and physics; it’s one of the few stories that doesn’t deal with aliens, in some way or other. It suggests a somewhat gloomy view of humanity’s future, which isn’t necessarily present in all of her work – for example, “And I Have Come upon this Place by Lost Ways” and “On the Last Afternoon,” along with numerous others, imagine humanity having spread out through at least part of the galaxy, if not always to everyone’s betterment. “And I Have Come” reflects a certain view of how to colonise, I think, which Tiptree challenges in really interesting – if somewhat nihilistic – ways – while “Last Afternoon” has a human dealing with two different types of alien creature and being confronted with his own, and his species’ mortality. Also post-apocalyptic-ish is “She Waits from All Men Born,” which is Tiptree’s most obvious meditation on the issue of death and its intimate connection to life. Very, very, clever. “Your Faces, O my Sisters! Your Faces Filled of Light!” seriously, seriously broke me. IT’S SO SAD. I’m pleased to see that this one was published as Raccoona Sheldon, because I cannot imagine anyone thinking this was actually written by a man. At the same time, “Houston, Houston, Do You Read?” was published as Tiptree, and it’s one that I can kinda understand as being seen as masculine, but at the same time – so, so not. “Houston” is one of my favourites of the whole collection; it’s just so damned clever, the reveals come so teasingly and obviously, once they’re there. “We Who Stole the Dream” is, I think, the only story not written from the point of view of humanity. Instead humanity is in the place of ignorant, unhelpful alien – which is quite a shock in the middle of the collection. It’s also, to my grieving heart’s extra battering, apparently set in the same universe as Brightness Falls from the Air, because it references Star Tears which are intricately involved in that (brilliant) novel’s plot. This is another really clever story about the lengths people (in this case non-human ones, but whatever) will go to, for their children. And so, in some ways, is “Slow Music” – another of my absolute favourites. Here humanity has interacted with aliens, but we never see them – we just see the result, which is the River, which appears to have attracted almost everyone on Earth. And so we’re left with a boy, who comes across a girl… and then there’s a most marvellous examination of modern life and its trappings. This is a seriously brilliant collection. I would recommend, though, not reading the introduction first, because there are a few spoilers, as I found to my annoyance. *In case you’re just joining us, James Tiptree Jr = Raccoona Sheldon = Alice Bradley Sheldon. Great review. I haven’t finished this yet myself. I’m still hoping I might do so before the end of the year, but I’m going to have to get on with it if I’m going to make it. Agreed, a wonderful collection! I remember picking this up when Arkham House published it in 1990 and was just blown away. I have such a fondness for Tiptree for excatly the reasons you describe – her ability to draw her characters through a myriad of seemingly “humanless” situations and draw you as the reader right along with them. Tiptree is one of my favorites. Well done! Yes, Tiptree is definitely a favourite of mine. Hard work but worth it!